Not too long ago I mentioned that Stetson was going to start training towards his Canine Good Citizens test. If you haven’t read my article that goes over all 10 tests in the AKC’s Canine Good Citizens Program then click on the CGC link. Here’s a short breakdown of the 10 tests and how Stetson did on each one. The cost of the CGC Test is normally $11, but we got to take the test for $5 because our evaluator didn’t have the CGC tags for our dogs. He did great during this part of the test. He seemed a bit distracted when our evaluator was petting him. He usually gets at least mildy excited when getting petted, but did great during the test and just sat in position. Stetson’s always been pretty good during grooming. We brought his brush and she brushed a couple strokes, looked in his ears, then checked both his paws. Stetson was in a sit position most of the time and then popped up when she picked up his second paw, but kept position. During the walk you have to make a left and right turn, at least two stops, and an about face. This is where I was almost sure we would fail because Stetson saw a moth slowly fly by his face and was tracking it while we walked. I was almost positive he was going to pull towards the bug. I told him to “leave it” a couple times and eventually he lost track of it. Besides the bug he did great! This one was pretty easy we just navigated through a three or four people walking around. Stetson barely noticed. Stetson did his sit and down perfectly…much better than he often does in class. He’s always been pretty good with stay and remained in place while I walked out 20 feet and then returned to him. When we were training for the test a couple times Stetson came then sprinted right past me. I made sure I caught him when he came at me. Sometimes he seems like he doesn’t know where his head is and plows it straight into your knees. Our evaluator had a bag full of dog training equipment and through it on the ground several feet from Stetson and also dragged her roller cabinet nearby Stetson. He wasn’t scared just mildy interested in the things going on around him. Another puppy raiser watched Stetson and said he was just fine for 4 1/2 minutes. He only had to stay in place for 3 minutes. The only areas I thought he might have had problems was when he was sniffing at Clover and when he was walking and tracking the moth with his eyes. The leash may have tightened a tiny bit during his walk, but I was pretty confident he was doing fine. We need to send in his paperwork along with $5 and the AKC will send us his certificate of completion. DUSTIN ALSO PASSED HIS CGC TEST! Great job Dustin! 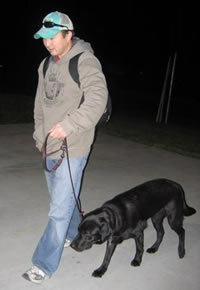 I’m sure you’ll do great when you move on to your formal training in Sylmar on February 16th 2008. We’ll see you next week at class. Dustin already wrote about his experience on his blog. The only time I got worried for Dustin was on come when called…he nearly detoured towards Clover, but Anne got Dustin to straighten out and he reached her successfully. Take a look at Dustin’s blog. Go over all of 10 tests and make sure your dog is prepared for each one. As the handler be confident and relax. Your dog will notice if you’re tense. Review everything several times the day of the test. 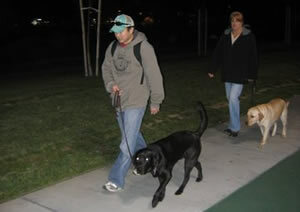 Make sure your dog gets ample exercise the day of the test before he/she is tested. Arrive early to get your dog used to the environment and the smells at the test site. We met up with another dog, Dustin and his handler Anne to review all parts of the CGC exam about an hour before test time. That’s about it. 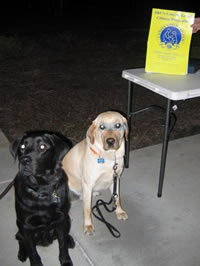 If you’re dog is taking the CGC test anytime soon and you have questions please email me or leave a comment. Thanks to everyone who helped us prepare Stetson for his CGC training including Ramona, Dustin, Anne, Jim, Virginia, Julia, Bennie, My Mom, Linus, Erin, Charlie, and the Loara freshman basketball team. We couldn’t have done it without your help. What do you think? Are you ready to pass your Canine Good Citizen Exam? Congratulations to Stetson and Dustin! It sounds like a lot of well-worth-it work. I don’t have the time or patience right now, and I am not sure that Gretel is even capable of getting it right because of her anxiety, but I do wish that my two were so well behaved.